"To sing is too pray twice." 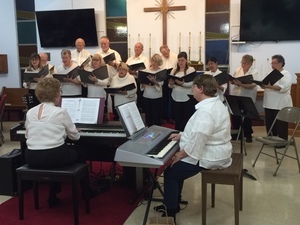 The purpose ~ Under the direction of Carole Maxosn, the choir enhances the worship experience of the parishioners. At St. Clement's we use music that directly relates to the lectionary readings appointed for each Sunday. Music is selected to further interpret and offer an expanded view of those readings. 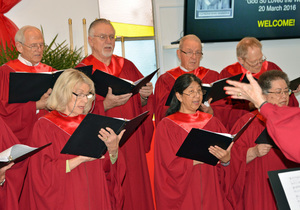 The congregation joins in singing a wide variety of music from contemporary Christian to traditional hymns to assist in that worship experience. An appropriate anthem is presented by the choir each Sunday. A fall choir retreat begins the year. Time is spent in getting better acquainted and planning the musical year. There are two major events presented by the choir each year. A Lenten gift to the congregation and the community on Palm Sunday afternoon and our annual Christmas performance followed by a banquet. In the past the choir has presented a "Madrigal/Boars Head Dinner" on the third Sunday in December. The church was transformed into a medieval castle, sumptuous dinners were served and the guests are entertained with all kinds of merriment. During Advent 2014 we departed from that event and instead presented each Sunday "The Mass of Angels and Saints". And in 2015, we presented to the congregation "An Early American Christmas" It began with an early American rendition of "Lessons and Carols" and concluded with a festive meal typical of the time. In 2016 we presented an Applachian Christimas followed by meal of Applachian type food. In 2017 we presented, Christmas Around the World. The choir rehearsal is held each Sunday after the 2nd service. We welcome new members. 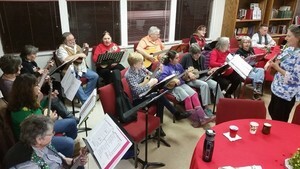 This group is all about FUN, FELLOWSHIP, and MUSIC! You need not be a member of St. Clements (or even be an Episcopalian! ), to join. You’re a Ukupalian when you say you are! Christmas Carols (for our St. Nicholas party & Christmas Caroling ). 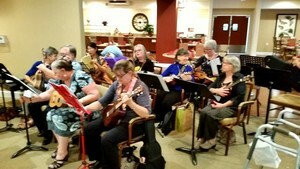 We also take this same music out to perform at assisted living facilities-, as well as occasional church functions. Join us some time and give us a try! We would love to add some percussion or keyboard if you play either as well- and we love folks that like to sing too! The St. Clement’s Ukupalians currently meet from 5:30. to 6:30 p.m. on Tuesdays in the church. Even if you’ve never played a stringed instrument before, this 4-week beginner course will take you from shaping basic chord- and strum patterns, to understanding tablature and beginning finger picking. If you’ve tried guitar and it was a little too demanding- give ukulele a try- I promise it is MUCH easier! Free beginner lessons are offered once or twice a year. We also have a Children's Ukulele Program, contact Zoe for more information.